NESCA News & Notes: The Brain in Numbers, Colors and... Wow! 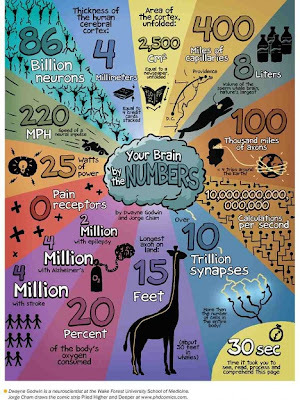 The Brain in Numbers, Colors and... Wow! An amazing picture by Dwayne Godwin and Jorge Cham from Ph.D. Comics. Click HERE for the full-size image just published at the Scientific American site. Definitely worth seeing in its hi-res glory! Dwayne Godwin is a neuroscientist at Wake Forest School of Medicine. Jorge Cham draws the comic strip Piled Higher and Deeper at www.phdcomics.com.